The Parc OL, Lyon city’s main stadium, is set to be fitted with a new lighting system and will be the only one of its kind in France. This summer, the Parc OL lighting system will undergo a major overhaul. This time, the traditional stadium lighting will give way to an LED system, one that will be unique in France. This technological innovation, already installed at the Juventus Stadium and the Amsterdam Arena among others, will allow the Parc OL to optimise the fan experience and give the public amazing light shows at every event. More than 260 LED projectors and 20 tracking lights will be installed from now until the league restarts on 5 August. From September, the installation will be completely in place and will give the public the chance to experience, for the first time in a French stadium, all the ways that a complete LED lighting system can enhance the sporting and scenic experience. 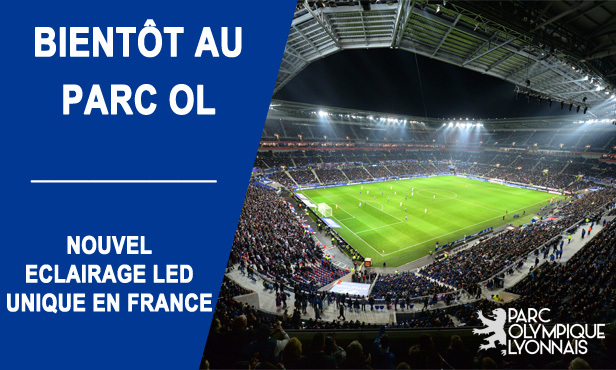 This investment, entrusted to the Philips Lighting company, agent of the group that includes Spie, Serpollet and Cobalt, shows once again Parc OL’s ambition to be recognisable on an international level for its organisation and the hosting of big international sporting and entertainment events.